Parts of this book are wonderful; there are funny moments, wry moments, and heartwarming moments, as well as several tense scenes. On the whole, I enjoyed the relationship between Josh and Caitlin, although I was slightly uncomfortable with the speed with which Caitlin jumped into it. Emily March's use of Josh's diary entries to reveal his backstory works really well, giving the reader insight into his psyche and making it easier to empathize with him. And the author gives an excellent portrayal of family dynamics with the Timberlake family. I had some personal issues with one aspect of the book, significant enough to bump my rating down to "Like" rather than "Love." (I can't go into details without major spoilers, sorry!) 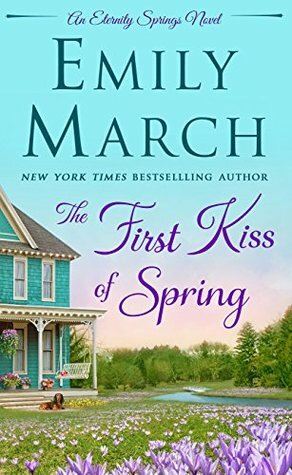 It may not bother other readers at all, so I would give The First Kiss of Spring a positive but qualified recommendation, particularly for fans of the series. It's solidly written and enjoyable overall. Sign into Goodreads to see if any of your friends have read The First Kiss of Spring.